It’s been a while since my last Top Twelve list, so I thought “What better list to compile around Thanksgiving than a list of butterflies?” Yes, butterflies. Moths, too. Okay, maybe there are more seasonal topics out there, but sometimes I just like random lists. If you want a good reason for a butterfly list in autumn, though, I guess I can point to something I heard on the radio about not raking your fall leaves for fear of disturbing butterfly eggs/cocoons that could be hiding among them. I don’t normally rake my leaves anyway, so I’ll gladly take another excuse. For this list, I’m ranking significant butterflies or moths in film. I’m only including films I’ve actually seen all the way through, so that excludes a host of films with butterfly titles, such as Butterflies Are Free, The Butterfly Room, The Mothman Prophecies, The Butterfly Effect, M. Butterfly, The Blue Butterfly, A Pin for the Butterfly, Butterfly’s Tongue, and several just called Butterfly. A special shout-out also to some TV butterflies as well, such as the pussycat swallowtail hunter on Gilligan’s Island, the fun Castle episode “The Blue Butterfly,” Star Butterfly from Star vs. the Forces of Evil, and the “killer” butterfly from the classic SpongeBob episode “Wormy.” In addition, despite my research, I feel like I may have forgotten some worthwhile entries that just aren’t coming to mind, so feel free to comment with any lovely lepidopterans I might have missed. On to the list! 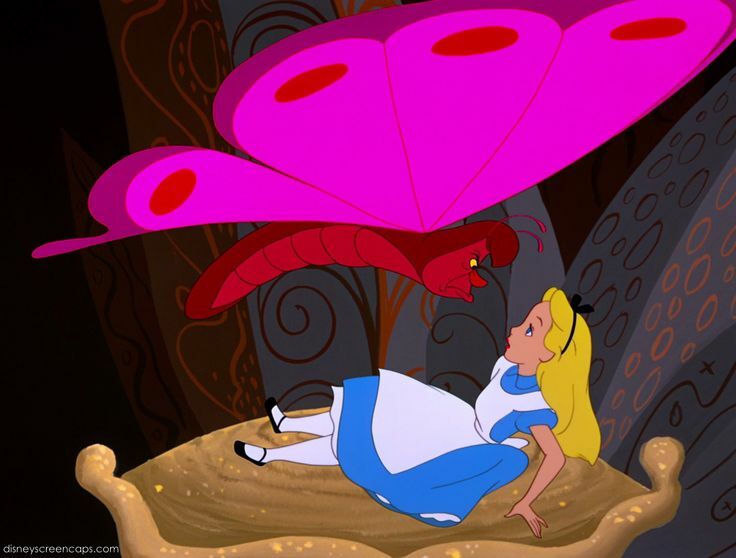 The hookah-smoking caterpillar is a memorable character in both versions of Alice in Wonderland, though his eventual transformation into a butterfly does nothing to improve his sour mood. And let’s not forget the bread-and-butterflies too. I couldn’t decide which anime film to give the edge to, so it’s a tie! In Cowboy Bebop’s stand-alone film, a terrorist’s poison gas causes hallucinations, specifically glowing butterflies as death approaches. And in a rather disturbing scene of Satoshi Kon’s imaginatively bizarre Paprika, the title character is captured and pinned as a human butterfly. The butterfly here is mentioned by the daughter of Robert Neville (Will Smith), the last non-vampire-ish resident of New York City. His daughter’s love of butterflies is a mere memory, but it also plays a part in the climax, which goes in two different directions depending on which ending you watch. 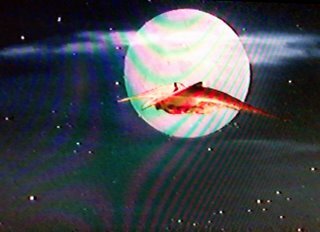 The end of this charming classic musical features Rex Harrison’s animal-loving doctor heading back to England atop the Giant Lunar Moth. It’s for anyone who ever wanted to ride a moth. Anyone? I always had this film confused with Bullitt and thought it would have a car chase, but it didn’t. 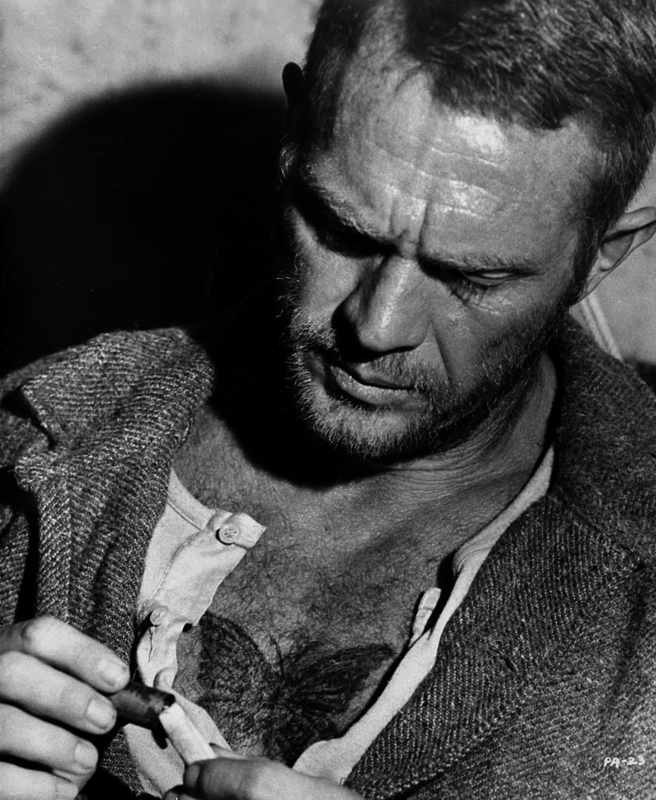 Meaning “butterfly” in French, Papillon is the nickname of Steve McQueen’s Henri Charrière, who is imprisoned on Devil’s Island in South America and refuses to give up on escape. He has a butterfly tattoo on his chest and even catches butterflies in the jungle at one point. I’ll be interested to see how this year’s remake compares to the uneven original. Since the one in Alice in Wonderland is a caterpillar most of the time, this is the only film here where a butterfly is an actual character, namely Gypsy (Madeline Kahn), the lovely assistant of Manny the mantis magician. She may not be one of the major characters, but a butterfly’s a butterfly, and I’d totally forgotten Madeline Kahn voiced her. I’m stepping outside the box a bit here to include a short film, the Oscar-winning Bunny (which you can watch above) from Ice Age director Chris Wedge. An elderly rabbit is annoyed by a persistent moth, only to discover the moth’s more symbolic and emotional nature. Butterflies are especially popular as metaphors, and this biopic of John Keats (Ben Whishaw) and his beloved Fanny Brawne (Abbie Cornish) has particularly beautiful symbolism. After Keats moves away, Fanny fills her bedroom with captured butterflies and gushes her affection through love letters, only for the passion to slowly die away like the butterfly carcasses that eventually litter her room. Who could forget the memorable final scene of this classic anti-war epic? A butterfly collection was seen earlier in the film, and when Paul Bäumer (Lew Ayres) reaches for one on a World War I battlefield, his hand is made motionless by a sudden gunshot. Neat fact: the hand is actually that of Lewis Milestone, the director. Of course, another list of mine had to feature Lord of the Rings! 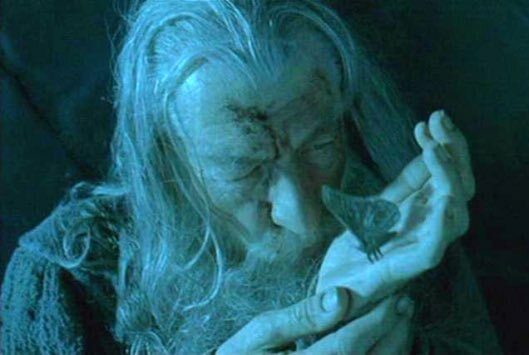 Gandalf’s use of a big hairy moth as a messenger eventually becomes synonymous with the intervention of giant eagles: saving him from Isengard, joining the battle at the end, and even extending their services into the Hobbit movies. That’s a handy moth to have around! I also must mention the scene in The Hobbit: The Desolation of Smaug, in which Bilbo peers above the treetops of Mirkwood and sees a host of butterflies flitting in the morning sunlight. As much as I would have liked to give Lord of the Rings the #1 spot, it had to go to The Silence of the Lambs. I mean, just look at the famous poster! Serial killer Buffalo Bill (Ted Levine) has an affinity for the death’s head moth, raising them and inserting them in the throats of his victims. It’s also one of these moths that gives him away to Clarice Starling (Jodie Foster), and since it plays such a key role in the plot, I had to give the top spot to this morbid moth. Corpse Bride – The title zombie dissolves into butterflies at the end. Dallas Buyers Club – Matthew McConaughey visits a room full of butterflies (see top photo). Heidi – In the 2015 version, seeing a butterfly helps crippled Clara to stand. The Last Unicorn – At the beginning, a capricious butterfly tells the unicorn she is the last of her kind. Mothra – This would have been a really obvious choice for the list, but I haven’t actually seen a Mothra movie. Still, after Godzilla, he’s the second most popular giant monster over in Japan. Snow White and the Huntsman – In that Sanctuary scene copied from Princess Mononoke, the fairy elk explodes into butterflies when it is shot. Valerian and the City of a Thousand Planets – Watch out for butterfly-fishing! You’ve Got Mail – Meg Ryan points out a butterfly on the subway. Feel free to comment with any other cinematic butterflies I might have missed. Below is a lovely butterfly song from Hannah Montana: The Movie, back when Miley Cyrus was normal. It may be several months before we get to see real butterflies again, but hopefully this list will hold you until then! It may seem a bit late, but don’t forget to vote in Round 22 of Opinion Battles for your favorite film to kick off a Halloween marathon! I picked The Conjuring, a modern classic of horror, but you can plan ahead for next Halloween and vote for your choice, whether obvious or obscure. Halloween is here and that means time for a couple of horror rounds, the second question would be, what would you pick first in a horror movie marathon, this question should be everything open to what people do or don’t like in the genre. If you want to join the next round of Opinion Battles we will be take on What is your Favourite Post-Apocalypse Film, to enter email your choice to moviereviews101@yahoo.co.ukby Saturday 11th November 2017. Them obsolete, as we do steam. And cars that fly with plasma wings. It boggles my mind that people complain about no originality in Hollywood anymore, and then the fifth Transformers film makes millions while Valerian flops. Luc Besson’s French import based on a classic French comic immediately sparked my interest based on the trailer alone, and I knew I had to catch it on the big screen. Valerian and the City of a Thousand Planets is easily one of the most visually imaginative films I’ve seen, resplendent in its CGI-heavy universe that resembles Star Wars, Star Trek, and Avatar on steroids. It starts out with one of the rosiest visualizations of first contact ever, a brief but brilliant montage of mankind’s collaborative camaraderie expanding to include thousands of alien races. Centuries in the future, the diverse species of the galaxy will converge aboard the space metropolis of Alpha, and human government agents Valerian (Dane DeHaan) and Laureline (Cara Delevingne) are tasked with protecting it when a mysterious danger arises. That’s about as general a description I can give, because the plot is fairly simple at its core but so surrounded by frenetic action and less-than-necessary tangents that it seems more complicated than it is. Yes, it probably didn’t need a memory-eating jellyfish or a shape-shifting pole dance, but Luc Besson’s exuberance for his material is obvious and fun in this all-over-the-place approach. Most of the criticisms aimed at Valerian focus on the casting, and I’ll admit Dane DeHaan and Cara Delevingne would not have been my first choices to play the two leads. Neither imbues their character with anything very unique, and their personalities are rather flat as a result. Yet I wouldn’t say they were bad but rather passable. There’s nothing overtly mockable in their relationship like Anakin and Padme, and their chemistry and interactions are enough to maintain our interest in everything that happens around them. While Clive Owen, Ethan Hawke, Herbie Hancock, and Rutger Hauer show up to lend some brief recognizable star power, the more interesting characters are the CGI alien creations, like the three gremlin-bird-things that wander around trading information like money-grubbing Ferengi. Rihanna as a shapeshifter offers an especially enjoyable addition to the lead duo, though I wish she had had more screen time. More than anything else, I enjoyed Valerian and the City of a Thousand Planets because it showed me things I’d never even imagined before: pristine alien beaches for harvesting energy pearls, glowing butterflies you do not want to touch, extra-dimensional shopping malls located in the middle of a desert. For an independent film, the Oscar-worthy visual effects rival anything that Hollywood has put out. The action scenes were spectacularly thrilling, and I didn’t stop to care about the film’s flaws when I was watching Valerian escape from a crime boss through a multi-level alien bazaar while his arm is trapped in another dimension. It was just a fun ride, particularly an extended shot of Valerian bashing through wall after wall of Alpha’s various alien habitats. I will gladly defend Valerian based on how much it entertained me, and I wouldn’t doubt that it will become a cult classic, not unlike Besson’s other quirky, polarizing sci-fi The Fifth Element. Nevertheless, I’m torn on how to personally rank it because the closer I get to the end of the year, the more I realize I’ll have to remove genuinely good films from my Top 365 list to make room for this year’s additions. At this point, I’m not sure that Valerian warrants that, since I must acknowledge the relative weakness of the characters and plot, including an extended glimpse of life on one alien planet that goes on for too long. Even so, it’s a film I greatly enjoyed and plan to see again soon, so perhaps it will rise further in my estimation after another awesome visit to the future. “If I won the lottery,” so many say. 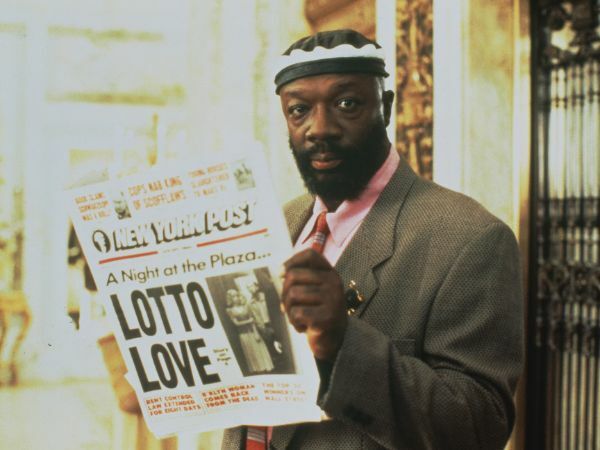 “If I won the lottery,” oh, what a day! For six random numbers confirming their luck. If you won the lottery, would it change you? But often result in more pain than you knew. Enjoy life a bit before you’re money-struck. There’s something refreshingly old-fashioned about It Could Happen to You. For a ‘90s rom-com with Nicolas Cage and Bridget Fonda, I can easily envision a 1940s version with Jimmy Stewart and June Allyson. (It’s easy for me to picture them together after The Glenn Miller Story.) There’s a wholesomeness here that you just don’t see nowadays, strengthened by the “Once upon a time” fairy tale narration by Isaac Hayes. For all his nuttier roles, Cage is admirably down-to-earth as responsible NYPD officer Charlie Lang, who’s beloved of the whole neighborhood except for his critical wife Muriel (Rosie Perez). Strapped for cash at a diner one day and too upstanding to not leave a tip, he promises down-and-out waitress Yvonne (Bridget Fonda) that he’ll split his lottery ticket with her if he wins. Lo and behold, he does, much to Yvonne’s delight and Muriel’s chagrin. Everyone uses their newfound fortune differently, and it doesn’t take long to see Charlie and Yvonne deserve each other far more than greedy Muriel or Yvonne’s also-greedy husband (a barely recognizable Stanley Tucci). Based on and greatly exaggerating a real life story from ten years prior, It Could Happen to You begins with a universal what-if question of winning the lottery and extends that to ask whether Charlie should uphold his promise and how best to wield such riches. We as the audience may not be as humanitarian as Charlie and Yvonne, who freely share their wealth with the less fortunate, but we’re hopefully not as heartless as the scheming Muriel. Most people probably fall somewhere between the two extremes, but seeing them side by side reminds us just how laudable a Charlie or an Yvonne is in this selfish world. Yvonne even points out that, as decent people, they seem to be “freaks” in a place like New York City, but the end suggests that there are far more lovers of decency than the news headlines would have us believe. Despite having an all-around charm to it, I must admit that It Could Happen to You isn’t very strong in the comedy department. I don’t remember laughing once, though Cage and Fonda largely made up for that with their sweet chemistry. On the other hand, Rosie Perez’s grating voice made her excessively unpleasant, as if the courtroom scenes with her calculating lawyer weren’t enough. Don’t you hate those scenes where some devious lawyer twists the facts to paint the worst possible picture of an innocent defendant who’s too inarticulate to escape being backed into a corner? I do, so the film’s second half was a tad annoying before it bounced back to satisfying. With the classic tune “Young at Heart” sung by both Frank Sinatra and Tony Bennett, the film evokes a vaguely similar tone as Sleepless in Seattle but could have used a more humorous script. Still, lacking much profanity or objectionable content, it’s a reminder that Hollywood once did PG-rated romances just as well as the R-rated ones. Fonda and Cage have rarely been so appealing, and the end is likely to leave you with a smile. Like we humans when we kill. To we who brand and scorn and hate. Survival is our common rule. Far worse than other creatures can. In sharing greater depths of heart. There are some movies that, no matter how well made they are, just tend to fall into the second tier of their genre. The Zookeeper’s Wife is one such film, yet another historical drama based on true events of endangered Europeans dealing with the Nazi occupation and risking all to help Jews during the Holocaust. Such films are guaranteed to be emotional and impactful as they strive to emulate Schindler’s List, but although I haven’t been able to bring myself to watch Schindler’s List for comparison, I can tell that The Zookeeper’s Wife likely won’t win any Oscars, if its March release date wasn’t already a hint. 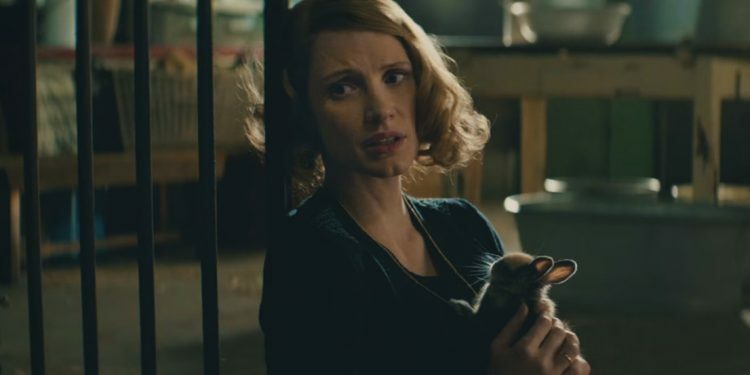 Jessica Chastain as Antonina Żabiński is the titular wife to Johan Heldenbergh’s zookeeper Jan Żabiński, both of whom happily run the Warsaw Zoo in the days leading up to the German invasion. As someone who has always enjoyed visits to the zoo, I enjoyed the scenes with the diverse animals, which are charmingly natural, as if it’s perfectly normal in this family to cuddle with a white lion cub. Of course, those scenes are quickly upended by Nazi bombers who decimate the city and many of the exhibits, leaving released camels and big cats to add to the chaos. 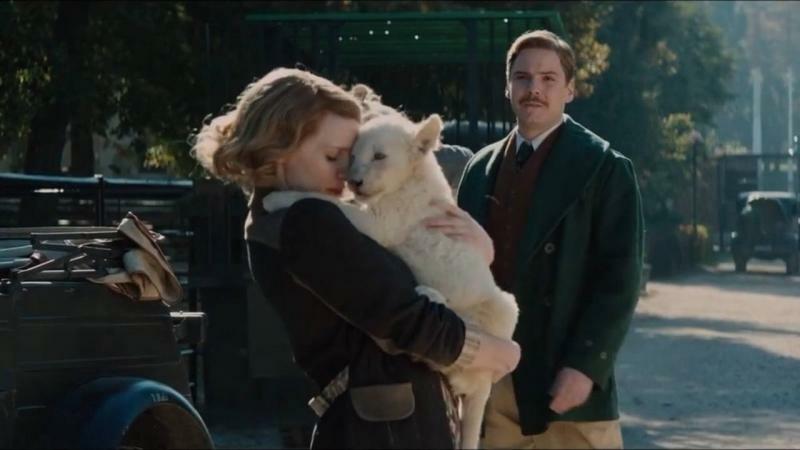 These scenes and the deaths that result can be distressing for animal lovers, but the film doesn’t dwell on the animals themselves for long, as the zoo is promptly emptied by Hitler’s chief zoologist Lutz Heck (Daniel Bruhl). Without a zoo to care for, the Żabińskis turn their attention to the impounded Jews of the Warsaw Ghetto, choosing to take part in an Underground Railroad to help them to safety and hide them in the zoo. All three of the main actors do excellent work here, particularly Chastain, fake accent and all. While his character is far more actively involved in the resistance movement, smuggling Jews from the ghetto in a garbage truck, Heldenbergh is oddly sidelined at times, hence why the film isn’t called The Zookeeper. Having played a Nazi before in Inglourious Basterds, Bruhl is respectably menacing in his romantic advances toward Antonina, which she humors for the sake of keeping him off the scent of her hidden friends. When he does catch on, his jilted fury is frighteningly unpredictable during a heart-in-the-throat scene toward the end. While some details are given at the end, I do wish there was a little more information about what became of the Żabińskis afterward. There’s little negative to say about The Zookeeper’s Wife. My VC read the book and found this to be an admirable adaptation, despite certain changes. The music, the locations, the moments of shocking inhumanity and heartening empathy are all commendably effective, but not quite as involving as they would seem on paper. It’s ultimately more encouraging than some of its devastating cousins, perhaps owing to the restraint afforded by its PG-13 rating. There is no shortage of Holocaust movies, and considering how easily mankind forgets, even today, there need to be many more, so The Zookeeper’s Wife deserves to be seen, even if it’s not one of the stand-outs of the group. Cannot see, know, or even believe. Will destroy all that we now perceive. That could show me the things I have seen. Maybe then they’ll all know what I mean. Well, it’s about time I got to see this movie. Considering its cult popularity, I’m surprised how hard it was to find a copy through my usual sources, a search that delayed this review as my intended October Blindspot. So now that I’ve watched Donnie Darko, what do I think of it? I’m honestly not sure! I can’t pin down exactly how I feel about this independent favorite. Not since Cloud Atlas has a film left me so befuddled, but at least that movie impressed me enough to know I liked it. Along with October Sky, Donnie Darko helped establish Jake Gyllenhaal as a rising star of the early 2000s, and they certainly proved his range. 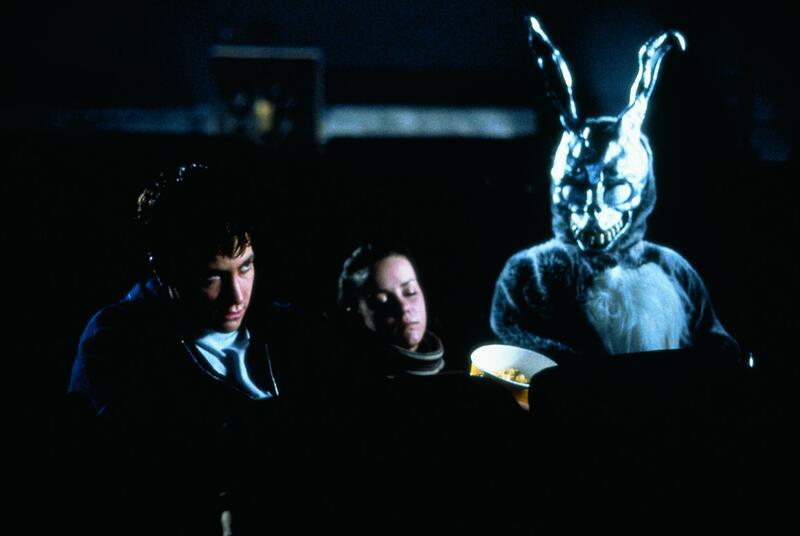 While his Homer Hickam in October Sky was all starry-eyed inspiration, Donnie Darko is a rebellious and mentally troubled teen who is told the world will end by a man in a demonic bunny costume. You can’t get much more different than that! Although I much prefer October Sky, Donnie Darko is consistently, um…I guess the word is interesting. I found myself engrossed in what would happen next simply because I wanted to know what the heck was going on with this teenage malcontent and his delusions of a bunny man named Frank. There are a lot of disparate elements and compelling side characters in Donnie Darko, and I’m not convinced they all come together as they should. There’s Donnie’s budding romance with the new girl in class (Jena Malone). There’s a local motivational speaker (Patrick Swayze) whose positivity methods are derided. There’s a committed English teacher (Drew Barrymore) whose literature choices are denounced by the self-righteous gym teacher (Beth Grant). There are a bullied oriental girl who Donnie sympathizes with and a senile old woman (Patience Cleveland) who keeps checking her mailbox and once wrote a book on time travel. And in the midst of all this is Donnie, antisocial, prone to cynical outbursts, and a regular with his hypnotherapist (Katharine Ross). A special mention too for Jake’s sister Maggie Gyllenhaal as his sister in the movie as well. It may seem like I just listed all the characters for no reason, but that’s kind of how I felt watching the movie, as if each of these characters only mattered when they interacted with Donnie and didn’t go anywhere without him. Surrounded by a general sense of gloom, Donnie’s visions are intriguing as we wonder whether they’re real or just a product of paranoid schizophrenia, and there are plenty of memorable scenes, whether from Donnie’s sardonic barbs, the dreamy moments of destruction, or the well-utilized soundtrack with songs from Tears for Fears, Duran Duran, and Echo and the Bunnymen. (Get it, Bunnymen? It is set in 1988, after all.) I had a vague idea of how it would end, but I’ll admit that one scene totally shocked me and the final scenes were unexpectedly poignant, even as I wasn’t sure how much I really understood. Donnie Darko is a lot of things at once: an angsty teen drama, a sci-fi thriller version of Harvey with psychological underpinnings and brilliant foreshadowing, a critique on holier-than-thou hypocrites, a black comedy with some weirdly funny dialogue. That bizarre Smurf conversation could only come from an independent movie. As I came to terms with my belief that the plot only makes sense if it’s all a delusional premonition in Donnie’s head, I did some research and found that there’s a much more complicated backstory with tangent universes and manipulated dead that isn’t really touched on in the film (at least the theatrical version I saw) but offers plenty of food for thought in trying to justify this overly complicated version of events. I guess it all comes down to the fact that what ends up happening had to happen, but I think the real “why” to this convoluted tale is only really known to writer-director Richard Kelly. I’m not decided on how much I actually liked Donnie Darko, but it certainly got me thinking, which is always welcome. I can see why it earned a cult following, at least among those who enjoy the effort of trying for it all to make sense. And the nights are as light as the day. Since they’ve no other choice but to stay. Are as bright and as white as the snow. Where the sun never leaves the landscape. It seems I’ve been neglecting my dear VC, not having reviewed one of her picks for well over a month. To fix that, she had me revisit a film I saw years ago and only remembered certain scenes. I thought my memories were more vague, but watching the movie brought them all back so I guess it was more memorable than I thought. 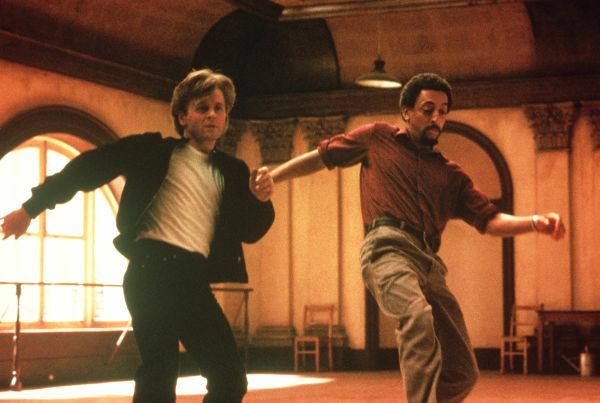 With a title referring to Siberia’s lack of sunset, White Nights is unique as both a Cold War thriller and a musical combining two dancers-turned-actors with different specialties, tap dancer Gregory Hines and ballet dancer Mikhail Baryshnikov. When I say it’s a musical, that doesn’t mean people break into song at random moments, but since both of its main characters are performers, they each get to strut their stuff on stage throughout the film. Baryshnikov’s character of Nikolai Rodchenko is practically autobiographical, a famed ballet dancer who defects from the Soviet Union. When his plane crash-lands in Siberia, he is taken into custody by the Soviets, who task disillusioned American defector Raymond Greenwood (Hines) with convincing Nikolai to voluntarily serve Soviet interests, whether he likes it or not. This is a case where it feels that the movie was made just to team up two talented dancers, employing a Cold War plot meant to keep it timely. That’s not necessarily a bad thing, but let’s just say the dance scenes are far more memorable than the Soviet intrigue. 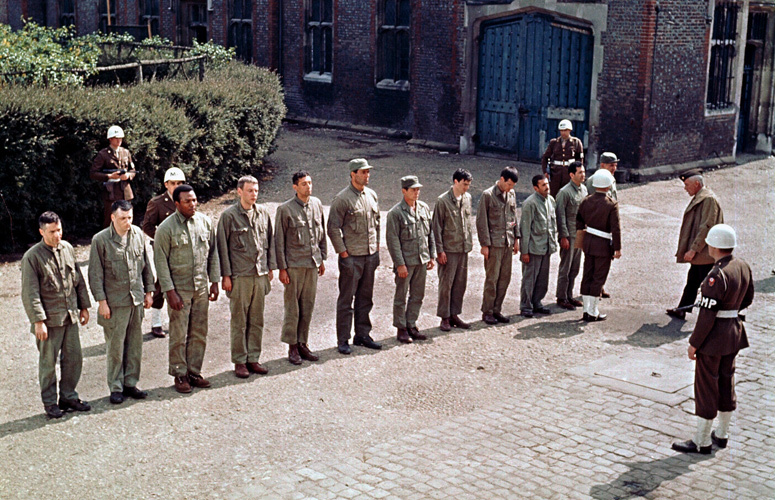 Hines gets to show off his talents as dancer, singer, and actor, with some personal theatrics that make his conflicted character sympathetic, though they don’t quite convince us why the heck he would pick the U.S.S.R. over the U.S. He has surprising chemistry with Isabella Rossillini as his wife, as does Baryshnikov with Helen Mirren as his ex-lover, so there’s little negative I can say about the acting. Likewise, the musical numbers are marvelous, from Baryshnikov’s modern dance opener (Le Jeune Homme et la Mort) to Hines’ tap rendition of “There’s a Boat Dat’s Leavin’ Soon for New York” from Porgy and Bess. The real kickers are when the two let loose freestyle in the ballet studio, though I do wish those scenes were longer. Yet, despite the great dancing and decent tension toward the end, I feel that I could just as well have watched the musical highlights and skipped the occasionally boring scenes in between, just as I can enjoy Lionel Richie’s Oscar-winning song “Say You, Say Me” or the also-nominated “Separate Lives” sung by Phil Collins with or without the movie to which they’re attached. While my VC probably won’t be pleased with my ranking, White Nights is simply not one of my favorites, despite the pleasure of seeing two very different dancers collaborating with some athletic and complementary choreography. It’s a decent film all around, and I’m struggling to find much negative to say about it, but it’s one I’d probably only watch when she insists. Don’t forget to vote for your favorite ghost movie in Round 21 of Opinion Battles! Ghost movies aren’t just for Halloween, and one that I can watch anytime is Ghostbusters 2, the slightly funnier sequel to the classic original. That’s just my opinion, but be sure to vote for yours as well. Halloween is here and that means time for a couple of horror rounds, the first we are looking at our favourite film involving ghosts, we have some of the most frightening or comical films but what will everyone pick? If you want to join the next round of Opinion Battles we will be take on What is your First-Choice Halloween Horror Marathon, to enter email your choice to moviereviews101@yahoo.co.ukby Saturday 28th October 2017. I personally love ghost film, I find something in all of them but One Missed Call bought into horror something I never thought would be scary, an asthma inhaler. I know that doesn’t sound like the most threatening but trust me it is, the ghost side of this film comes from ghost haunting the students who need to figure out why.